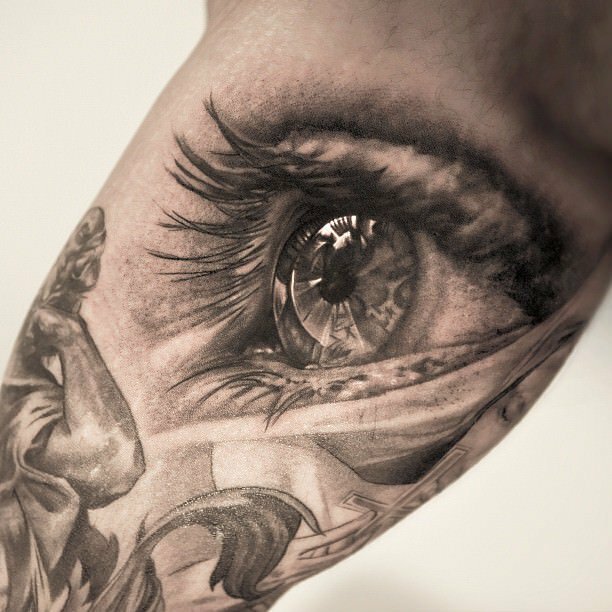 Among a variety of tattoo models, the pictures with eyes have got a real mesmerizing effect. When performed in correct shape and color, it seems as if it is looking at you. Here we can see an eye of the universe beholder. It looks as if a super nova has exploded inside some entity while the pupil fulfills the role of a super massive black hole that consumes everything around into a total nothingness. This option is specifically for those who prefer to be on a darker side. 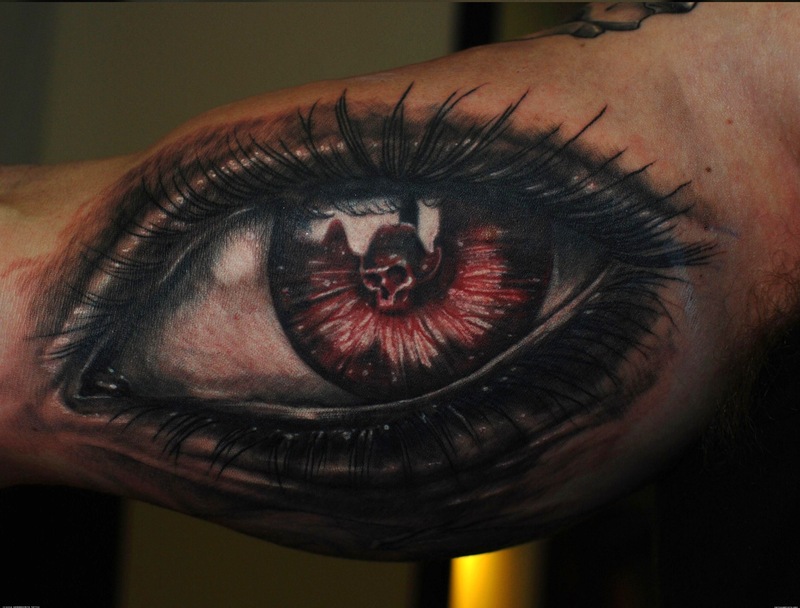 This tattoo illustrates the eye of a demonic entity that leaded the infernal legions of the damned as per Louis Le Breton. It slightly resembles the eye of the ram as the creature used to have the head of this animal. It is performed in orange colors – the color of fire. This would be an excellent tattoo for a metal music fan. Here’s a tattoo variant for those who desire a piece of dark art on their bodies. 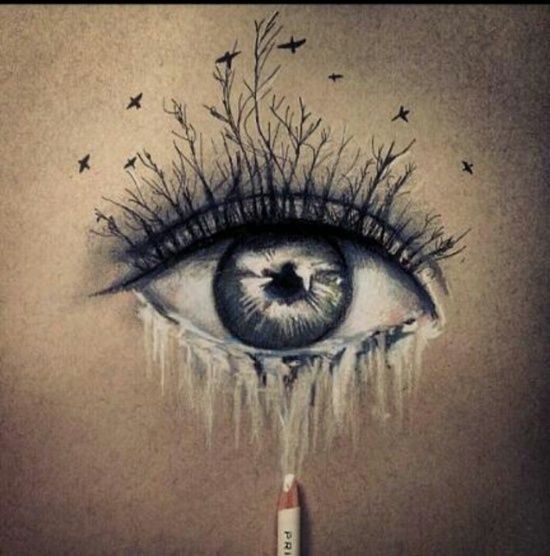 We can observe here a desolated forest of eye lashes with lonely birds that fly above it in search of something. The trees have grown through the eye piercing it with the roots. The colors which were selected grant a hint of slight depression and even sorrow for something is unexplainable. 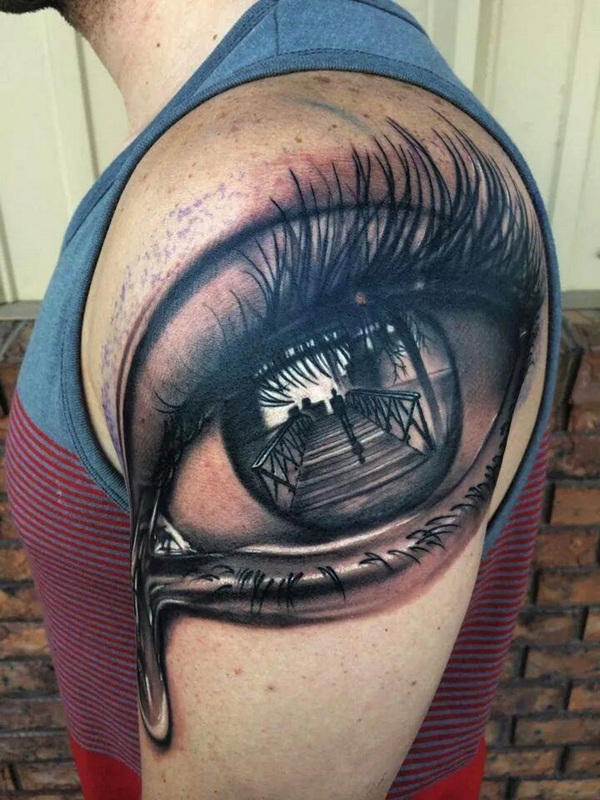 See a tattoo with a marvelous 3d effect. Some parasite has infested the body and it grew bigger and bigger until it got tired of living inside the bearer and decided to break down from the cell of host’s flesh. 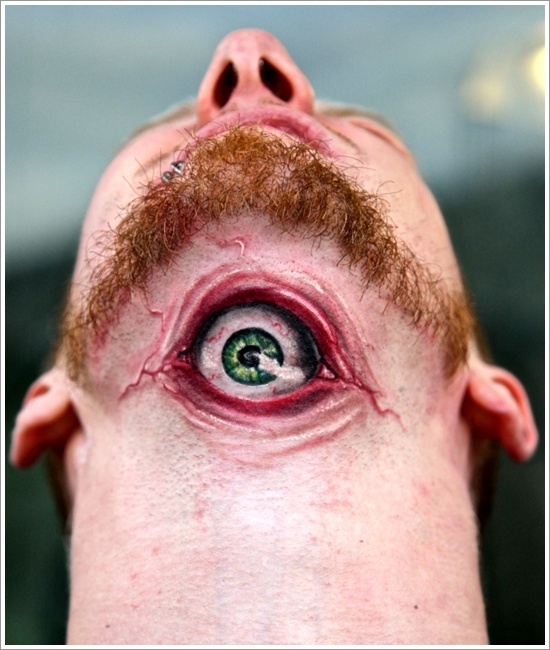 This is quite a surrealistic body art that is filled with plenty of macabre and gore. 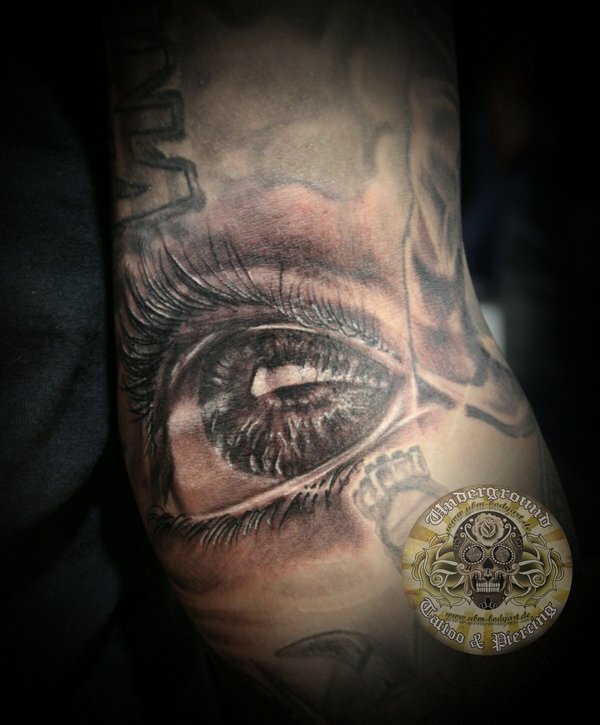 If you are searching for a totally new dimension of the tattooing art, you will find it the most applicable. Some tattoos can become a real masterpiece of arts, just like this option. As you can see it demonstrates a perfect realism in combination with the classical art of Greece. Pay a closer attention to the level with which the details were brought to the viewers. Every line of the needle was thoroughly worked out to bring the masterpiece to perfection. Each eyelash, the texture of pupil, the statue of some god – everything is fascinating. The bringer of light? – Where does the name come from? If we take a deep insight into the mythology we will find a symbol of Egyptian god of light – Horus. He sacrificed his eye to resurrect his father Osiris and battle with Seth, god of chaos. 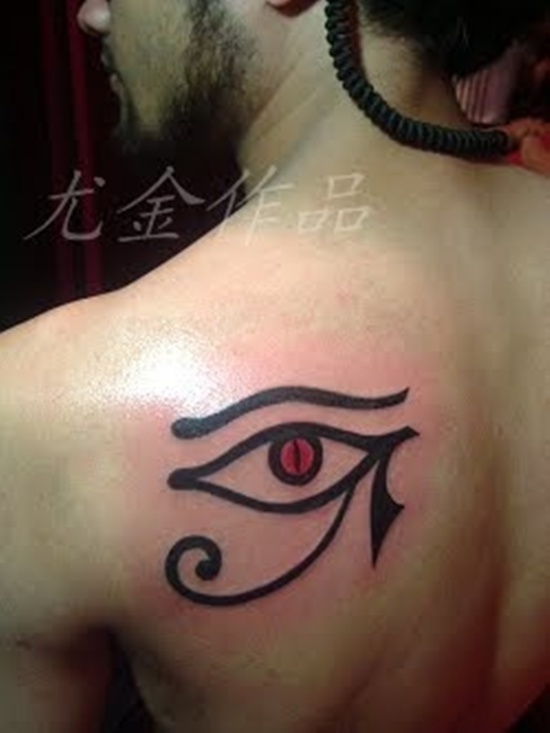 Since that time the eye of Horus is associated with wisdom and great spiritual strength. So why shouldn’t a person have such a meaningful tattoo?! 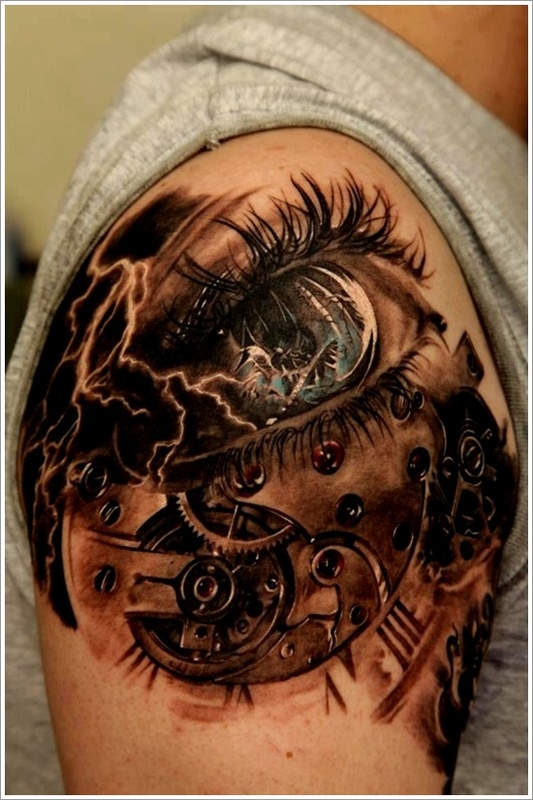 As you can see this tattoo design introduces us two popular styles in modern culture – Steampunk and Biopunk. That depicts the society that was stuck in the epoch of steam and became dependent of various gears, while other represents the world where all the parts of the body are modified in one or another aspect. 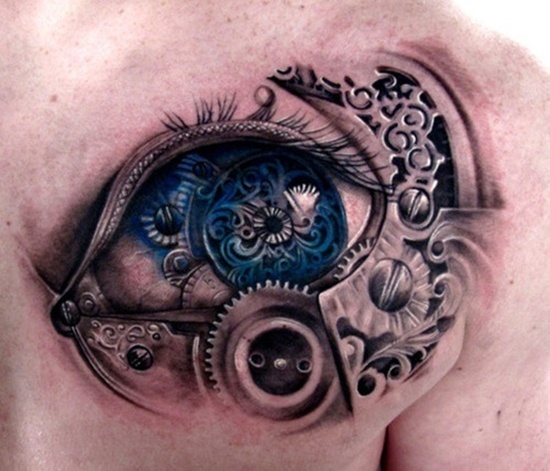 This option shows us a gorgeous modification of an eye by some sort of mechanism. Another creation of creepy art is knocking at the door. As most of the representatives of the type, it was performed in natural for the dark art shadow tones. If you look closer, you will see the redness of the white. The eye itself is painted in red and the pupil is demonstrated in shape of a scary skull that is watching from the abyss. 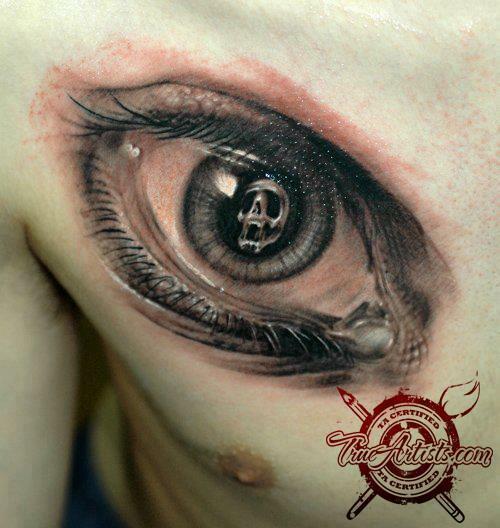 Some of the people who adore tattoo art state that monochrome style body art is the best among all. Those people who have got multiple experiences say that monochrome art shows the ability of the master to manipulate the shadows. 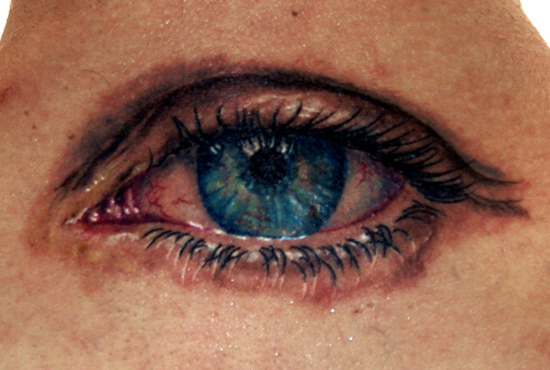 If everything is done correctly a realistic effect can be achieved and it might seem that the eye is like a real one. One should also remember that adding a mirror glitter is the hardest thing. The eye tattoos have got something special about them. They’ve a mysterious scent around them and that point makes them so special for people. Imagine standing in a total darkness and quietude. Suddenly you hear a dripping sound that resonates with an outer world breaking down the tranquility of some deep underground lake. It seems to be such a romantic idea for a woman. Here we have a tattoo that plays upon the nostalgia of the user. It applies an eye with the reflection of some important event or person for the wearer. 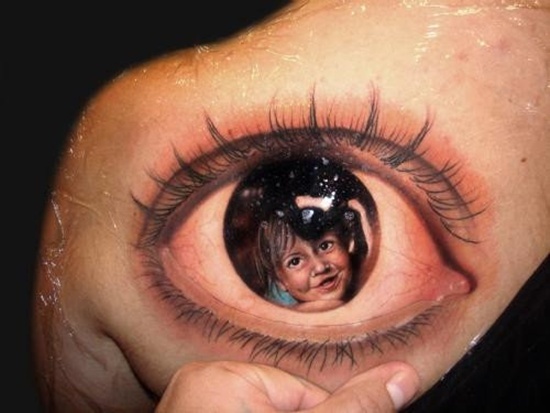 In this case we’ve got a portrait of the kid in the eye that was skillfully depicted on the shoulder of the wearer. The hand of the master can reproduce any image that you wish and make it a part of this composition. 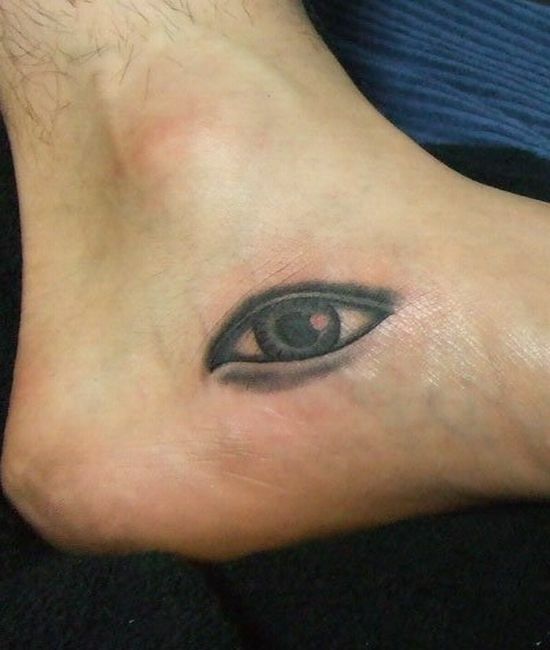 The tattoo of the eye can be placed in various places and it shouldn’t necessarily be extremely big. Some people enjoy mini pictures that are similar to this one that was placed at the arching of the foot. It is produced in a superb minimalism with a decent attention to tiny details of the image to maintain an overall look of the art. What makes the picture to be most realistic and effective? – That’s right the details. When a great deal of attention is granted to the tiniest detail, it totally transforms even a simplest image. The eye that we can see here is one of the patterns that have been done with such an elaborate design. Each movement of the needle is the movement that makes the picture alive. Everybody dreams of fairy tales and this tattoo is just a reminder of such magical stories. It was probably inspired with some sort of magical bird, probably phoenix. As we can state it was done with pretty confidence due to the colors that were selected and feather like details. It looks like some magical talisman on the back of the owner that was created with some special purpose. This is quite an inspiring tattoo! 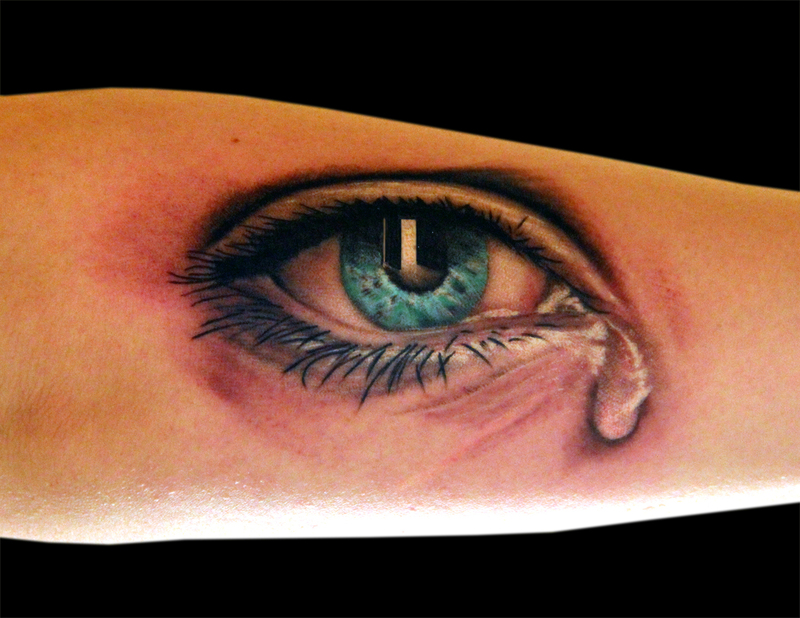 It depicts a beautiful azure eye with a tear that is ready to fall down from it. 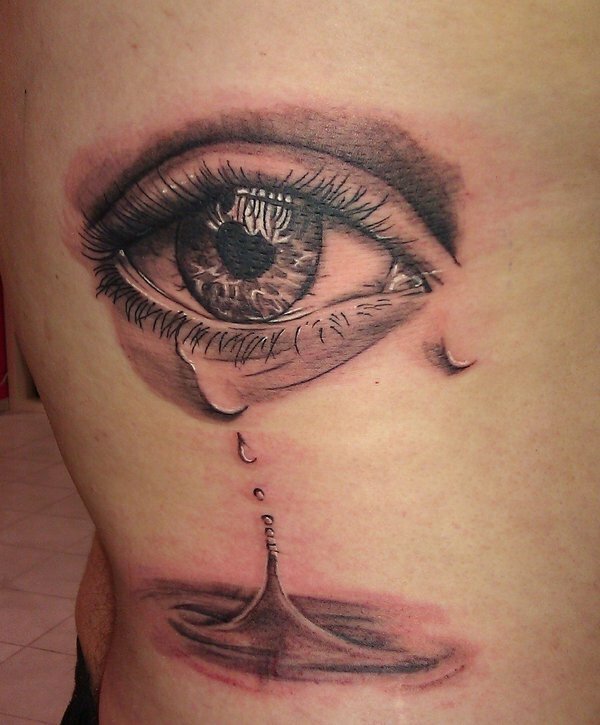 When you miss someone it is totally natural to cry sometimes, this tattoo would be perfect for emotional people who prefer something unusual to describe their inner world. The overall design is made very close to life so that people were amazed with the brilliance of the body art that has been demonstrated. In various cultures an eye has plenty of meanings. However, one of them is common for various nations. The eye symbolizes an all knowledgeable being that exists in every extent of time and space simultaneously, observing and apprehending the entire world. This variant is similar to the top of the mercury’s staff – the Caduceus that became a symbol of the alchemical knowledge. 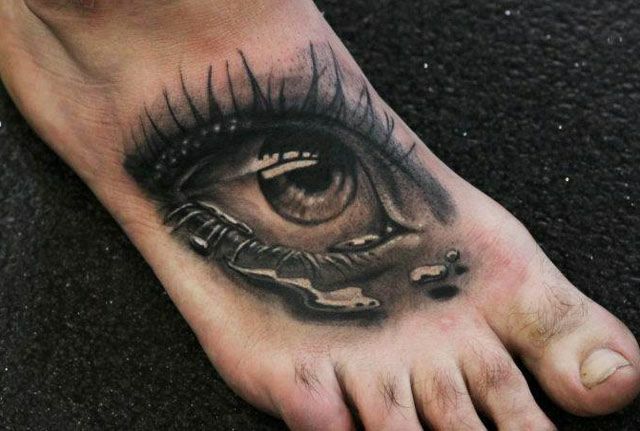 This eye tattoo is quite a sensitive one. It introduces an eye that was overfilled with emotions and is on the verge of crying. The blue color and the naturalistic glitter of wetness in the eye are made specifically bright to contrast with the red veins that we usually can see when a person have been overfilled with emotions and cried for a long time. This is quite an unusual solution for a tattoo. An art under a chin looks at first unnoticeable and it might seem that there is nothing at all. When you cast your head upwards, your little secret will be revealed as your inner beast will rip the throat and get out from you. 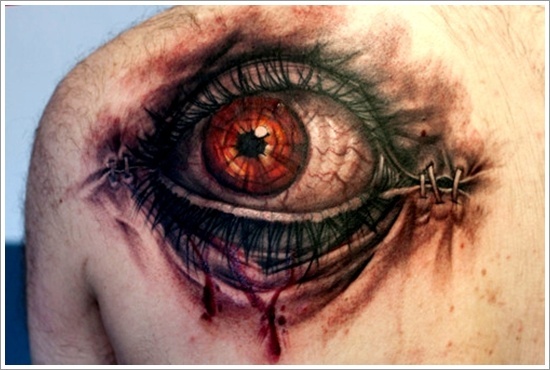 Pay attention to the design of the tattoo, it looks really terrifying as if some real being is there. Every human being has got personal demons which are hiding in the darkest corners of the soul and this eye perfectly illustrates that. It leads the way to the darkness that is reflected in this frightening skull which is longing to consume its next victim. If you take a closer look, you will see that the eye does not belong to a human being – there are scales at the corner. 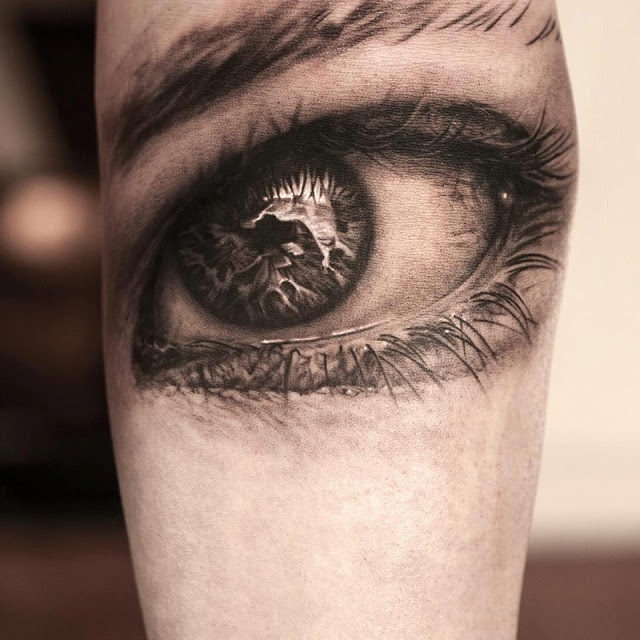 This eye art can boast with a kaleidoscope texture of an iris which looks so awesome that one can feel mesmerized as he or she looks inside the image. The game of colors that we can see here is achieved not only with a proper selection of the hues, but also with the selection of their correct geometrical position in correlation with the neighboring colors. For those who are in love, we can advise such a tattoo that makes a fine composition of a word “Love” that chains the wrist around and a crying eye that symbolizes sadness when the loved person is not nearby and you wish he or she was here. This is a very romantic idea for a person in love, who wants to add a memorable image on a body. 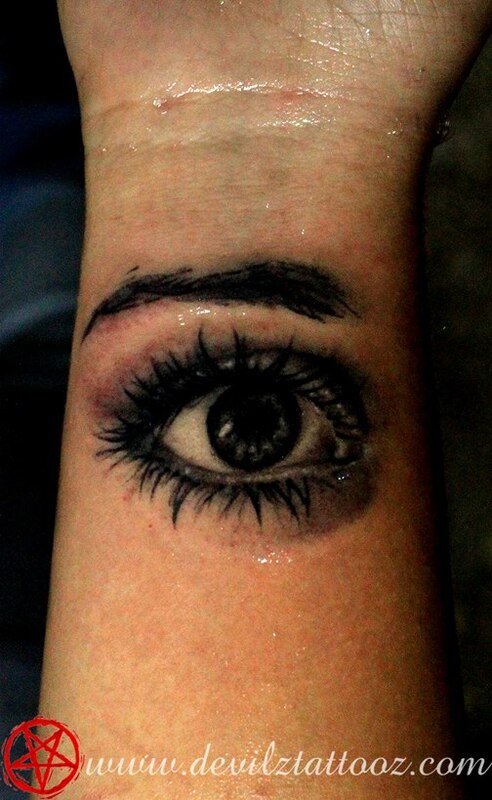 This monochrome tattoo is characterized with extremely voluminous eyelashes. As you can see each of the hairs is elaborately designed with every movement of the brush to achieve maximal effect. 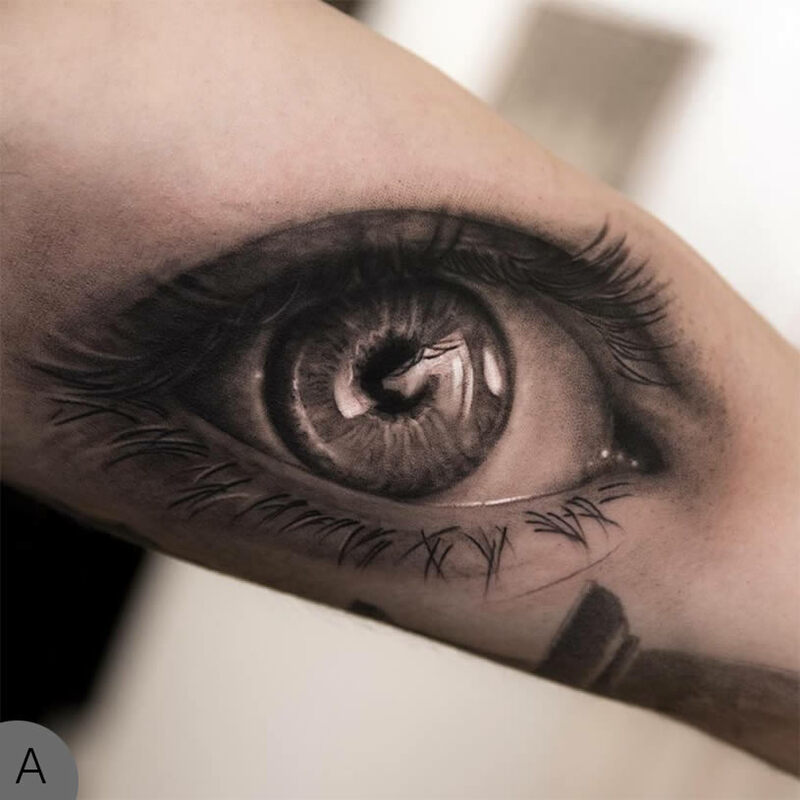 This eye tattoo would look gorgeous on the hands of the lady as it will surely add some feminine charm to an overall style of the wearer. Some special attention should also be granted to the iris as it was made close to life with a natural gloss. If your soul desires some psychedelic and surreal art on a body, this model might attract your interest. 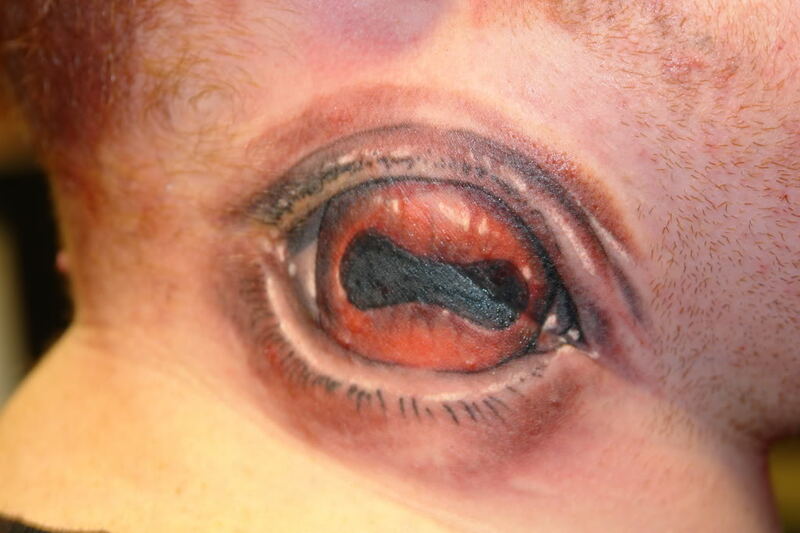 The model of an eye tattoo shows us a double entity that is fighting for a place on the skin in a single eye ball. One of the eyes is green while other is yellow. Both of them are shining with bright colors that are achieved with peculiar tattoo paint with special pigments. 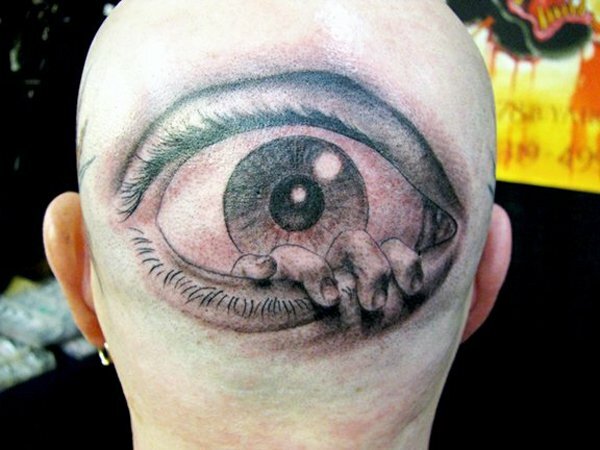 This tattoo is a perfect illustration of the Stephen’s Kings Novel “Door Man” when a person noticed that there is an eye on his palm. With a course of time there are more signs of some alien presence inside the body until something unknown starts using a man as a portal to another world. Just look with what anticipation the creature breaks through the flesh. 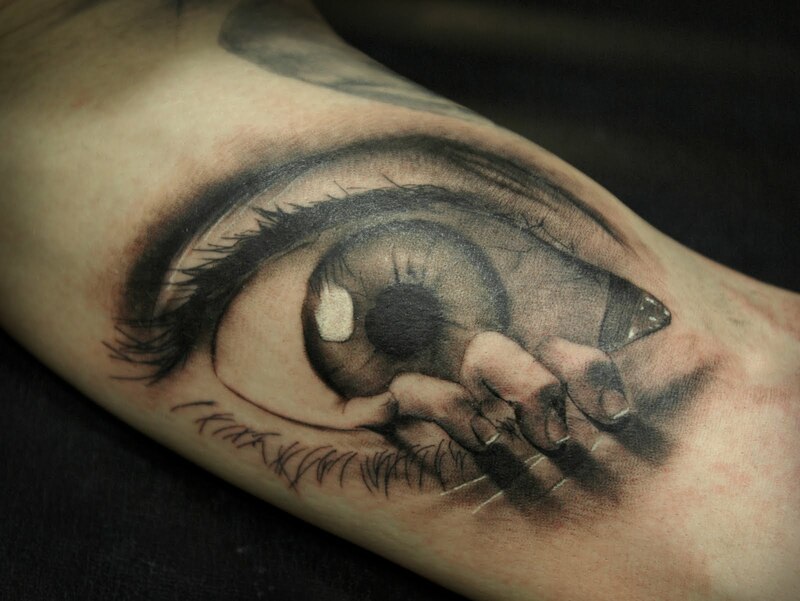 Here is another tattoo in a style of Salvador Dali. There are multiple pupils in a single eye ball that are moving in a circle, hypnotizing the user. Due to unusual selection of colors the spheres look like some planets that are moving around the orbit. 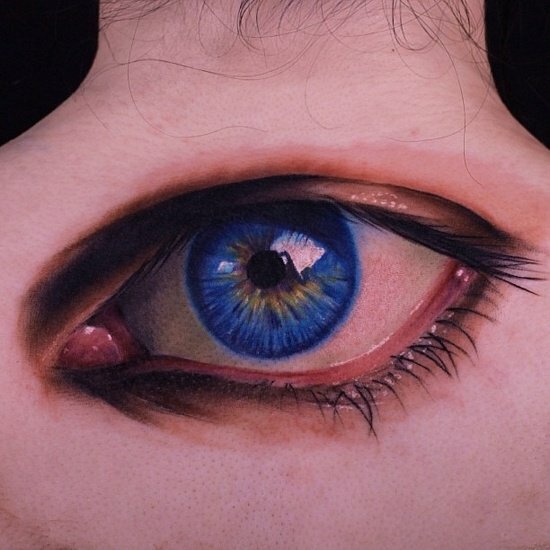 This is an awesome fantastic art for those who wish to see the difference in the design possibilities of eye tattoos. This indigo colored eye on the back of the wearer is made marvelously real. 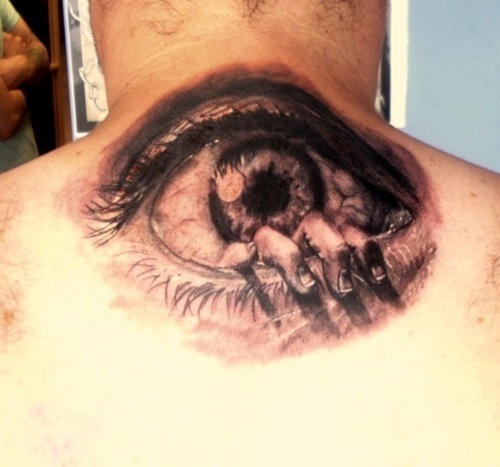 As you look at the tattoo, it might seem that any moment the eye is going to blink. There are many mythical ideas which consider the existence of the third astral eye that is capable of seeing the unseen. So why shouldn’t you make one on your back to have a perfect 360 degree look around?! The indigo color that was selected for the iris is a special color of the new age that symbolizes the enlightenment. For the guys who are passionate about the Egyptian culture, this hieroglyphical art would be an ultimate choice. It is a stylized symbol of an eye that is very similar to those which were found several decades ago on the Rosetta Stone that assisted in deciphering the ancient Egyptian. In fact, this is a symbol of light and rebirth that is considered an extremely beneficial sign for wearing. 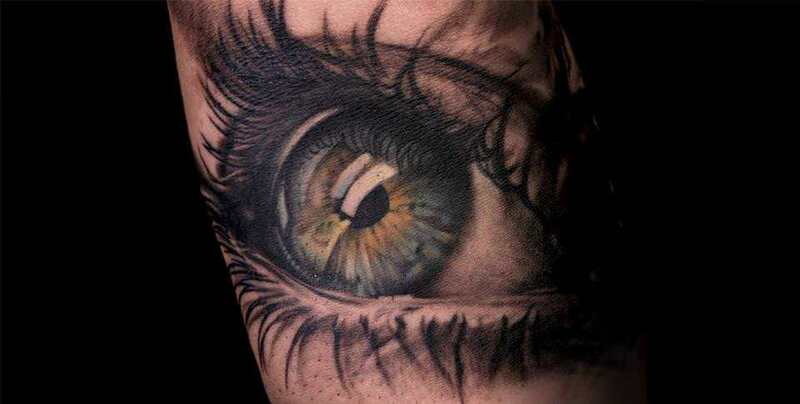 While looking at this eye one might feel the goose bumps that are slowly crawling on the back bone causing ice chill. Especially when it is placed at the back of the head, a person might seem a mythical cyclops, when looked from the back. And when we look closer at this art we shall see that it is really something terrifying: the white is a blood shot net of capillars and drops of black fluid that are slowly dripping from the eyes. 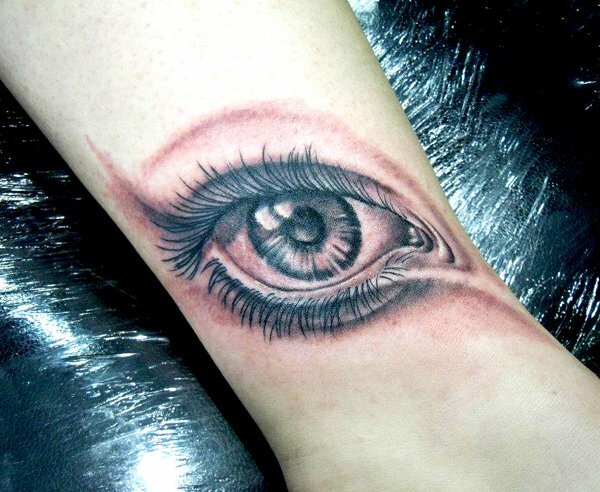 This tattoo introduces us a sensitive and romantic image of a dreamy person’s eye. It might seem that we see some distant clouds that are roaming freely through the skies like wild herds of horses. It reflects the inner desire of a person to be free. The artist selected the most appropriate colors for the design such as blue and yellow which are characteristic colors for the eyes of dreamy people. It’s a spirit in a mechanical shell that is totally real, at least according to this body art sample. Not many people would refuse such an incredible art on their body. This is an art of flesh and machine combination where the eye is powered up with some gears and made alive with a strike of a lightning bolt. Who knows? Maybe this is a reminder of the revival of the Frankenstein’s monster. The cage of flesh has become too small for this being. The pupil is narrowed down with tension to cut through the skin to get freed from the imprisonment. However, the owner of the being doesn’t want to let out his pet that easily. That is why the person decided to sew the entity inside his body. The designer of the art managed to transfer the tension of threads with the movement of the tattoo needle. 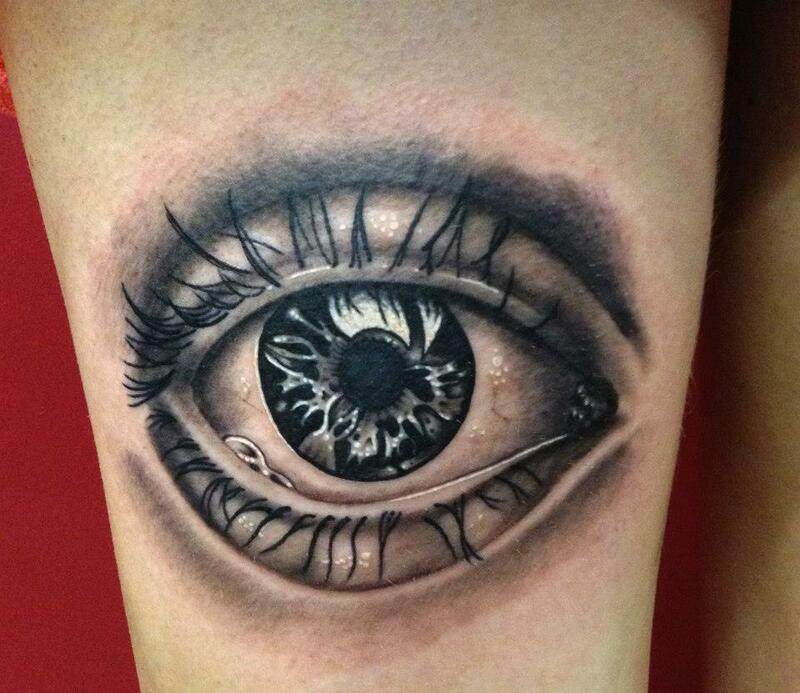 Do you want a tattoo of an eye? 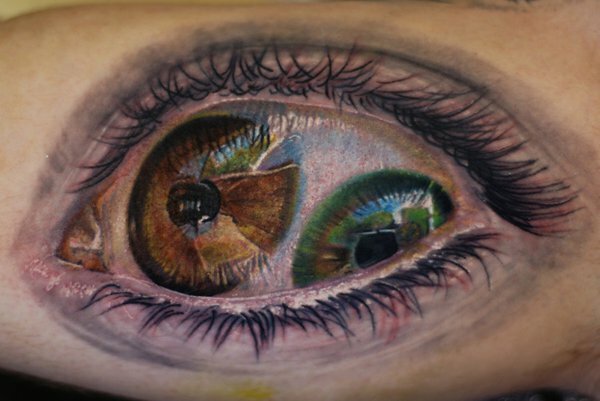 You are capable to transform your own eyes into a pair of awesome tattoos. 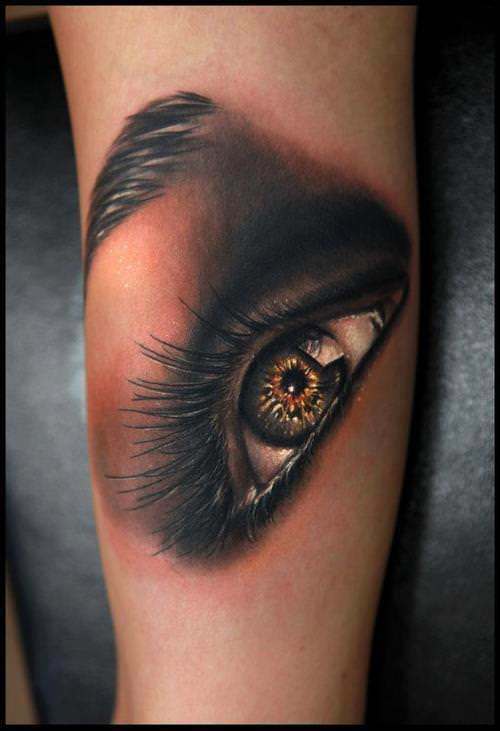 This is a brand new technology of the tattooing when the white of the eyes is painted into any unimaginable color. This technique is quite risky as it requires some serious skill from the master. However, the opportunities would be richly rewarded. 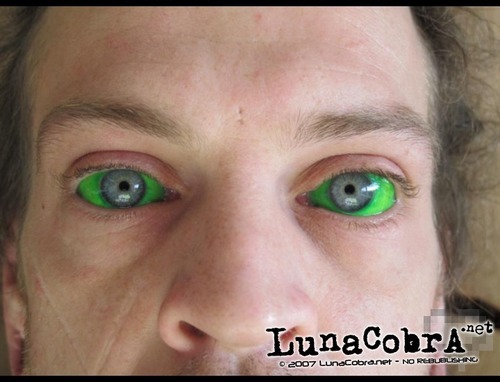 Just imagine the eyes that are glowing with green in the dark. There is something in this tattoo that will remind of an epic moment from the Shining movie, when the Nicholson’s character smashed the door with an axe, screaming “Here’s Johnny!”. Here, instead of the door, we’ve got a skull of the owner of the body art and hands that are looking thought the back of the head. This style is terrifically awesome. See another romantic image for your tattoo alternative. This time we have a black and white art of an eye that is floating in the clouds reflecting the spirit of a creative person. 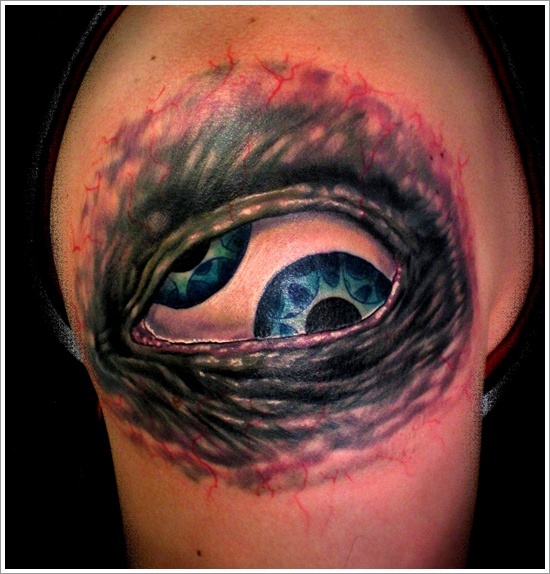 It manages to prove us that color is not always a necessary attribute for an awesome stylish tattoo. Perfectly performed monochrome tattoo will tell us a kind of an interesting story that is the goal of any body art. 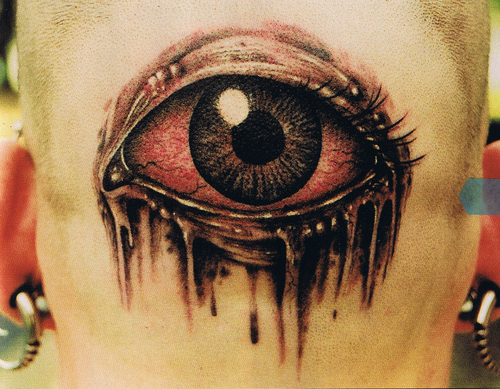 The author managed to add an unbelievable mirror style to the art of eye types of tattooing. It resembles a crystal ball that tells us the future due to a perfect gemstone structure. It looks so realistic so one is capable of seeing some dark shadows inside the ball. Who can tell what visions are these: good or bad omens? Only the ball knows the answer. Some people might have watched or played a game about the city of nightmare Silent Hill. 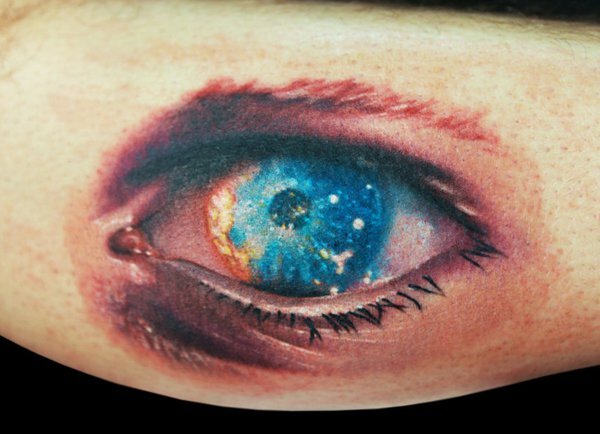 This tattoo doesn’t show any gore or horror that is reflected in this universe. It shows us an entirely side of the universe that is also depicted in this dark world – the voyage of a lost soul, the idea of which can be traced through the all episodes of the game. Here you can see a lonely figure standing on a misty bridge ready to disappear into nothingness. Although black and white this eye resembles a real one. The designer managed to create a marvelous effect of Mona Lisa. 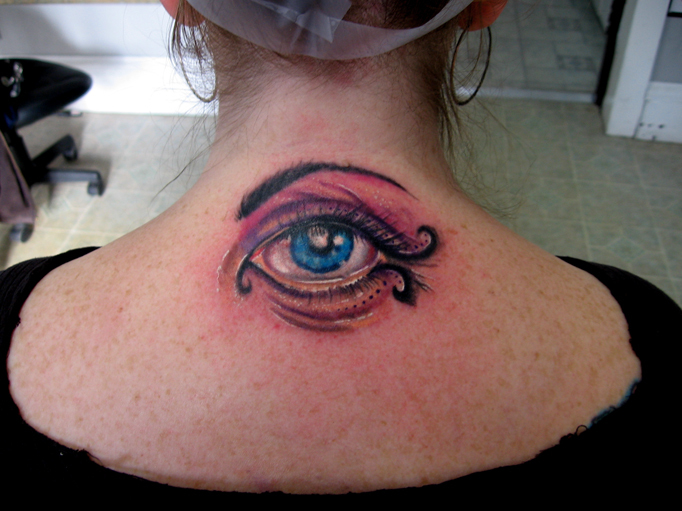 Regardless of the angle you look at the tattoo, it might seem that the eye is following your every movement. It looks as if it was made with some extremely thin ink pen especially after paying a closer attention to the lines of the picture. 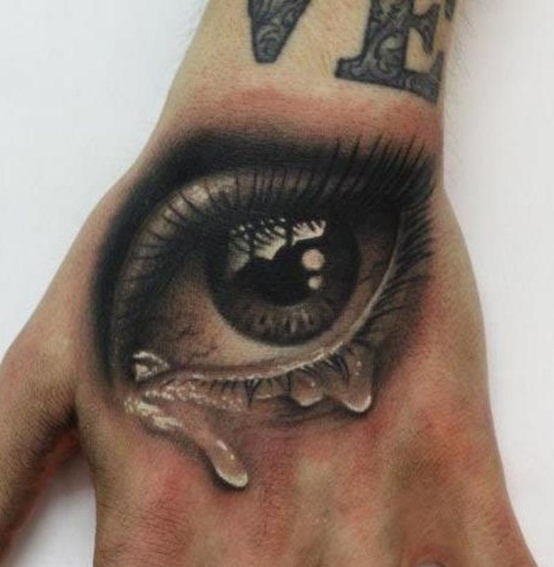 The eyes with tear tattoos are extremely popular among various people. 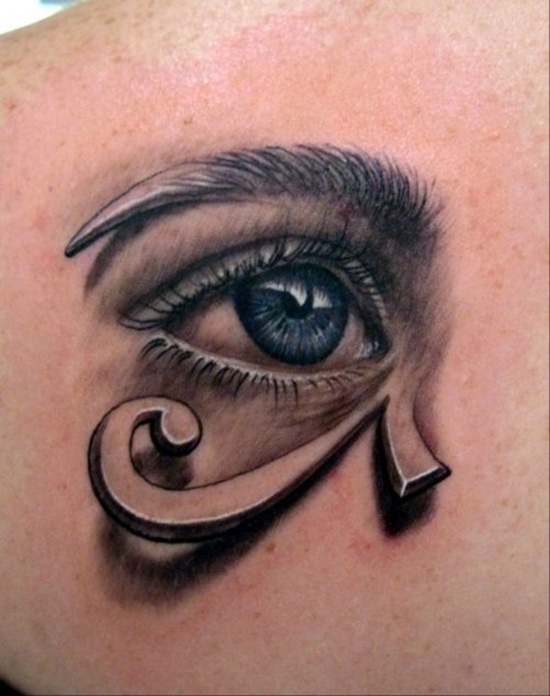 There is definitely something mysterious about this type of eye tattoos. Perhaps, it’s due to inner melancholy that sometimes is present inside people’s minds. 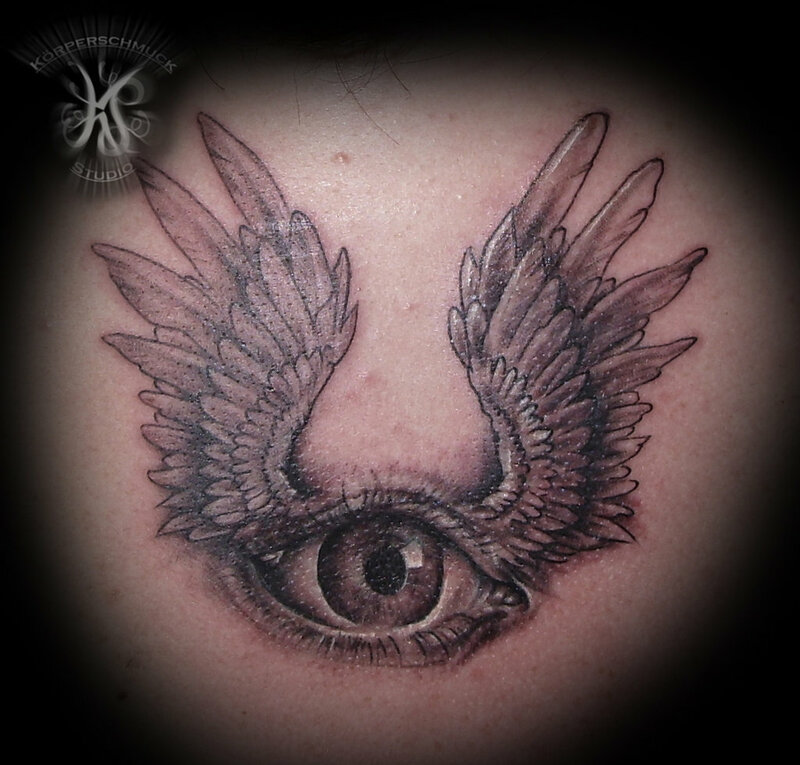 It is very simple and practical tattoo that will be a perfect decoration of the body.